Harbor Beach MI has the distinction of being the largest man-made, freshwater harbor in the world. Behind this huge harbor is a lovely small town of approximately 1,500 people. 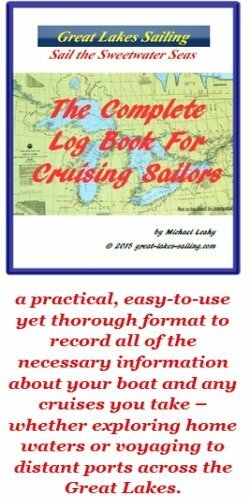 This is a very popular cruising stop for Lake Huron sailors. Originally established in the mid-1800's as a lumbering town, Harbor Beach MI has become a popular tourist destination as people come to enjoy its beaches, parks and fishing. The approaches to Harbor Beach MI are clear from all directions. The power station at the harbor has a 300 ft/91 m stack which would be visible in clear weather for 20 nm. If you are coming along the coastline from either north or south, keep well off as there are a number of charted obstructions that could create some unpleasant surprises! The harbor itself is created by 3 long seawalls with entrances on the north, east and south. This very large harbor has served as a harbor of refuge from the storms on Lake Huron since it was created in 1882. Do not use the south entrance as the water is skinny, there are charted obstructions and at least 2 wrecks. The main entrance is the East 'gap'. Once inside, turn to starboard and follow the seawall past the power plant and past the north entrance. The marina is just past the north entrance, in the north corner of the harbor. If you enter via the north entrance, turn to starboard - the marina will be immediately on your bow. Harbor Beach Marina has 114 slips with over half avaiable for transient sailors. There is a fuel dock (diesel and gasoline) and a pumpout station. Water and powere are available dockside. There are restrooms and showers. The grounds have picnic areas. While there is no repair or maintenance facility, the Dockmaster can help arrange for those services if necessary. Offshore Marina is located in the center of the west side of the harbor. Water depths of 3 ft/1 m make this marina suitable for power cruisers only. It has 70 slips with a number set aside for transients. There is a fuel dock (types unspecified) and restrooms. Sailors can anchor in the harbor as there is good holding ground. The preferred area is inside the seawall, north of the East entrance and south of a line extending from the powerplant stack to the seawall. As the harbor is open to the south, strong weather from that direction can make things uncomfortable. There are no marine repair and maintenance facilities in Harbor Beach. Downtown Harbor Beach is approximately 1 mi/1.6 km from the harbor. There is an IGA Supermarket on the west side of town. You would need a car to get there. There are several banks with ATM's. Chemical Bank is the closest to the marina. Harbor Beach Community Hospital (989) 937-6894 is located in the downtown. Harbor Beach MI has a nice range of small restaurants and bars. You could try the Harbor Beach Anchorage for their chicken or Al's Restaurant. Smalley's Bar and Grill has free wifi so you can compose emails home while enjoying a cold beer on a hot afternoon. Harbor Beach MI has a number of parks and nature trails around the harbor. There are biking and walking trails into the village from the marina. Every July, there is the Maritime Festival with exhibits, displays and talks on the maritime history of the area along with a party atmosphere and lots of entertainment. The Chamber of Commerce provides and information package to each visitor outline community activities and features of the village. Many restaurants and shops provide transportation back and forth to the marina - possible an option when reprovisioning. There is also the Harbor Beach MI site that will give you many ideas on getting the most of your visit.